Foursquare & Social Media: Is Foursquare the new Twitter? 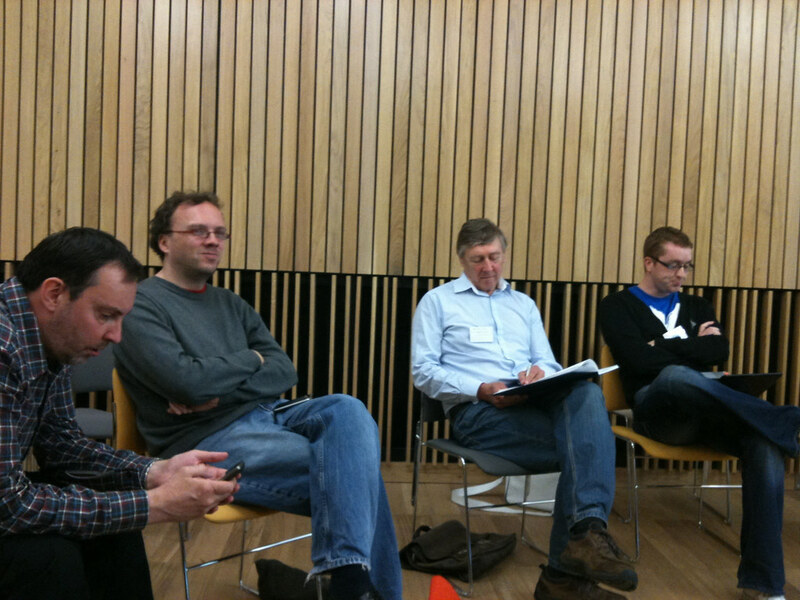 John Fox led this session and began with a description of Foursquare – a location based service largely for use on mobile phones. Although it was conceived for socialising it works well in urban settings and businesses in urban areas in the US are using it to incentivise use of various venues and branches. It is really big in the US. Foursquare has started to take off in the UK. Pundits are saying it could be the new Twitter. I remain to be convinced after several months of use. And I’ve been trying to find a use for a government context. I’ve written up my thoughts so far on my blog, x333xxx.com, with conclusions but I struggle to see any possible government usage. There are lots of issues around security, privacy, discreetness, and the generation of noise on twitter and facebook (where updates can annoy others). Roger: So does Foursquare appear as a map? Nicola: No but it relates to the map – your updates have geographic references but also shows where you are as a short text description (e.g. 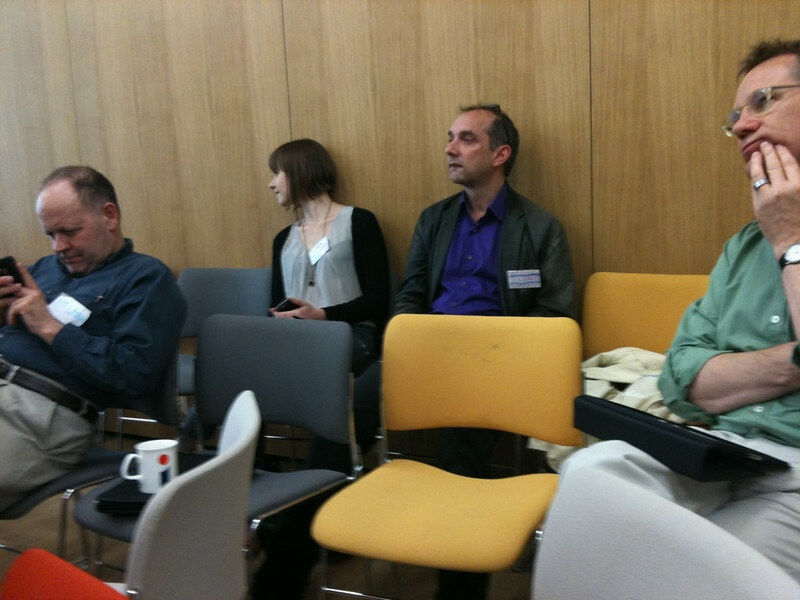 Nicola is at the Informatics Forum, Edinburgh). John: They can but then they can be very random such as those on Waverley train station [John read a series of these out – some are useful, most are just noise]. Nicola: Foursquare can be a super marketing tool, and that is it’s primary purpose, but I think, given that we’re asking if it’s the new Twitter, that we should remember that Twitter can geolocate Tweets and do much the same thing in terms of relating updates to the map. John: I think with Foursquare I see a good business use case since it’s a tool to help you understand your customers. But it is quite invasive. James: Indeed, there is a site highlighting the problem: Please Rob Me [NB: the location specific updates are now withdrawn for safety reasons]. Nicola: There are privacy options on all these services that can make them less dangerous but you do need good marketing cases to be worth entering this space and may need excellent FAQs for any authoritative use of such a space. Lynn: You could use these tools for tracking routes – potentially you could highlight trends and needs (e.g. everyone visiting the library next visited a coffee shop and a stationary shop – so maybe we need both facilities in the library). But we need more complex data to make this work well. Michael & a few others: It depends who you follow! Ian: It can spur change though – I know someone who thought their updates were looking so boring they started varying their route to work, the coffee shops they were using, etc. Lily: I like twitter and use it. But when Foursquare came out the idea left me cold, now that is especially because of my professional field (domestic abuse work) but I do question sharing that level of detail. Ian: In a way the idea is closer to Facebook than Twitter. N: Actually whilst we’re all saying that Twitter is established and the current big thing it is actually Facebook that is huge and there are quite complex class relationships around the use of different social networking sites. In the US Facebook is seen as a more middle class site whereas MySpace is seen as a younger but also a more working class space. danah boyd has done some really interesting work in this area (e.g. danah boyd (Forthcoming). “White Flight in Networked Publics? How Race and Class Shaped American Teen Engagement with MySpace and Facebook.” In Digital Race Anthology (Eds. Lisa Nakamura and Peter Chow-White). Routledge.). This offers some tricky challenges for selecting the right networks to engage with. Roy: It is dangerous to pick just one tool but there will be a converging of spaces I think. Ian: Indeed there is already some aggregation taking place. John: I was wondering, with my own employers in mind, about how the environment agency could use foursquare for marketing. The current government marketing freeze means creativity is very useful. There are also huge incentives to gathering information. Analysing users would be useful fro the agency and also for viral marketing possibilities. For planning and organising roadshows for instance. Ian: I think Foursquare bears exploration but it may not be worth going into whole heartedly. Nicola: There are also other location based tools or social tools that bridge the virtual and physical worlds that are useful, like QR Codes, stickybits, phone apps for specific places and collections (e.g. John Murray Collection NLS app) and those with hot spots. I was also at the Natural History Museum’s Darwin Centre last week and they are using collecting cards (based on barcodes), branded NaturePlus, so that as you look at exhibits you can grab information and online resources to look at at home later. There are lots of interesting tools relating information to personal experience to space. Lynn: RFID cards can also be used for understanding things that interest and matter to service users. There is a geolocation aspect again with these as well. Ian: These are definitely interesting tools for galleries and museums. They are also fairly low cost options. Lynn: I recently took someone to Edinburgh Castle and as you go in they ask you where you come from – I can see that tools like Foursquare could help you gather that sort of information about your users. Roger: As these are niche use tools the data is useful but certainly not statistically significant but they could be interesting. I think these are tools where you start to see unintended consequences of innovation though. 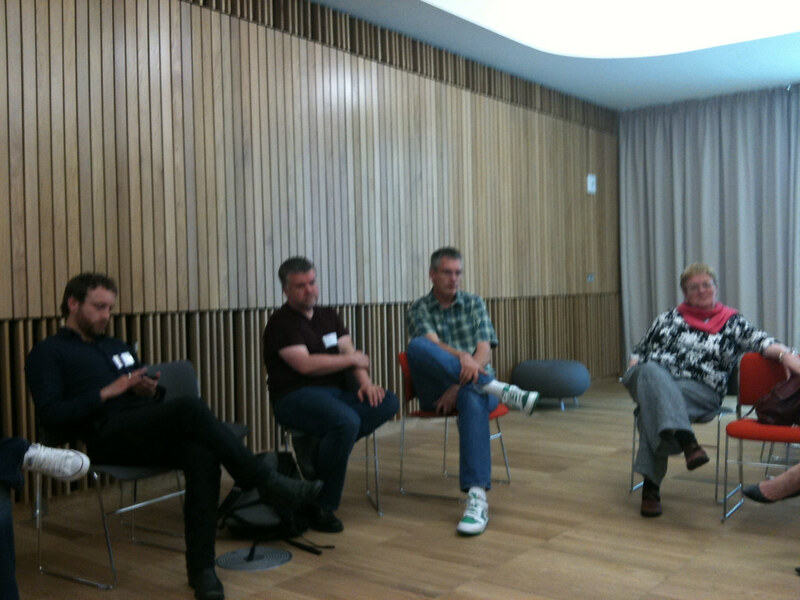 Richard: I would like to see a guide based on driving routes – perhaps one could use Foursquare for this? Ian: There already is an app for that actually: Wikihood. N: You can also, using various pieces of software, create your own maps with hotspots in specific places as well – there are really creative ways to do this. Catherine: Perhaps a potential public sector application (or standalone app) would be a guide to carehomes in an area that let you see where they all are, what they cost, what reviews and comments people have added etc. John: Yes, you could use it like Trip Advisor. But these things come back to their percentage of users. An interesting statistic here is that Twitter grew more than 3000% in the last year. We wouldn’t have predicted that. And Twitter is good for crowdsourcjng but also for learning stuff. But maybe there are limited contexts for governmento use Foursquare. Maybe it’s great for the US but maybe not for the UK? Lily: I like that twitter doesn’t have a business model. I am nervous that Foursquare has one and that is very commercial – but I may be paranoid. Miles: I do lots of social media research especially around twitter. We harvested data from their API because they were unwilling to share data in a more straightforward way: they stash data as their business model. Nicola: They have other business models too: promoted tweets, other advertising models, and recent changes to the Twitter terms of service do allow reuse of Tweets for TV, for other commercial partners etc. Miles: Aggregated knowledge of an area is the value in many of these tools. Richard: So these are not a sort of Rollercoaster Tycoon 2 – a big self-developing social system? David: I think Foursquare may be useful for service delivery. We met with a BT Futurologist recently and she was convinced it was next Facebook or Twitter. They are trying to build it into their service delivery model. Comment: All kinds of venues aren’t in these tools though. Looking at pubs in town here there are notable blanks. Is there a Groucho Marx element to Foursquare: “I don’t want to belong to any club that will accept people like me as a member” (thanks to Wikiquotes for the reminder of authentic wording there). Roger: Russell Ackoff talks about five types of information: Data; Information; Knowledge; Understanding; Wisdom. What is the wisdom in Foursquare? Comment: It is that knowledge of crowds I think. As we wound up this session John encouraged us to look at his blog posting on this topic and add comments there – and I would encourage the same (and/or comment here). Impressed you got all the names!